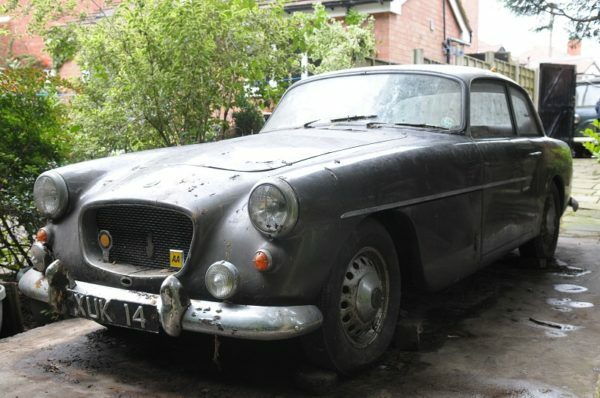 It’s not often that we in the SAHB can claim anything approaching a scoop, but this incredibly rare Bristol 406 has just appeared for auction. Some of you may already have heard about it, but a good friend of ours in one of the Bristol clubs has confirmed that it isn’t generally known about, even in Bristol circles. If anyone has some money burning a hole in their pocket, the auction is on 8th October at Beeston. This post is being written on Friday 7th October, so that is not much notice – but we suggest that it’s also a piece of interesting news, and it will be fascinating to see what price it fetches. First registered February 1959, two door, 2216 cc petrol engine, manual, 55,585 miles last taxed in 1991. The vehicle was purchased by the vendor from Anthony Crook Motors, who became the Bristol main agent, he was the second owner. The vehicle has been garaged for the last 25 years. The vehicle is complete, and comes with keys, starting handle, service book and manual. The car can be classified as a full restoration, the engine does not appear to turn and has not been started so therefore cannot confirm or not if it has seized. The bodywork is in generally presentable condition, painted in shell grey over tudor grey. The inside of the vehicle is commensurate with being stored for 25 years, the carpets have deteriorated, the seats are in generally above average condition, the passenger seat has a small hole and tear in it.. The dashboard is in good condition with all relevant dials in place however cannot confirm if they are in working order. All the window glass is present however the rubber surrounds have perished. The chassis has surface rust but there are no signs of any major holes. The engine bay has surface rust but again no obvious signs of serious rust. Many of the component parts in the engine bay have surface rust but again cannot confirm that they are in working order. The wheels are in above average condition, tyres will need replacing. Battery is present but will need replacing.